How to connect iPad to TV : Sony, Samsung, Apple, HDTV | Free Pc to Phone Calls, Free Voip Calls to India International ! We have discussed a lot of times about making video calls from iPad (iPad 2 or new iPad), using voip softwares like Facetime, Skype, ooVoo, FriendCaller or any other. We can assume that if you are having an iPad, then you are successfully placing video calls from it. However next step would be make video calls and see the other person on TV. Wouldn't it be awesome to view/talk to your friend on television. Well, we are talking about Video Calls on iPad where your screen is shared on your HDTV. What it requires is that you connect your iPad to your tv first. Offcourse apart from video calls, you can do other tasks as well like playing games, watching movies, youtube videos etc. So lets see how you can connect your iPad to your television (both wired connection and wireless). Please note that same tutorials works for connecting iPhone to your TV. So you can place video calls on iPhone, however share your screen on HDTV. 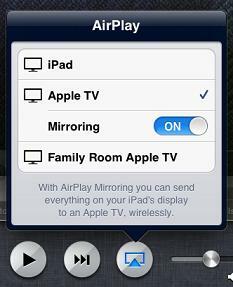 It is also known popularly as AirPlay Mirroring. You can use this feature to watch videos, stream online music, play games or make video calls. Connect your TV and iPad to same wifi network. Double press home button on iPad. Swipe left to right and select mirroring controls. Tap the button to see the mirroring devices. Select Apple TV. Enable AirPlay Mirroring from this menu by tapping the name of your Apple TV, then toggle the on/off slider to ON. You can connect your iPad to your TV via a HDMI Cable. The audio and video works great. Possible only with Apple's Digital AV Adapter. The resolution possible with iPad 1 is 720p and with iPad 2 or New iPad : 1080p. This is basically a display mirroring option which is just like Apple TV using a digital AV adapter. This is a great option for making video calls. You can also stream movies, and videos from your iPad to your Television. The Digital AV Adapter works great for the iPhone 4, iPhone 4S and 4th Generation iPod Touch. What if your tv does not have a hdmi port (its a normal lcd tv, but not HD). You can also opt for connecting the iPad to your TV with composite or component cables. The composite adapters break the video into red, blue and green, while the component adapters break it convert it to the single 'yellow' cable compatible with older television sets. Composite cable doesn't do mirroring, but it will route video-enabled apps, photos, and music to your TV. Use the Apple's VGA adapter, to connect your iPad to your tv which must be having a VGA port. You can connect it to a monitor or projector using this method. The VGA adapter will also support the Display Mirroring mode. Please note that VGA does not support sound, so you can listen it to build in speakers of iPad or use headphone's. 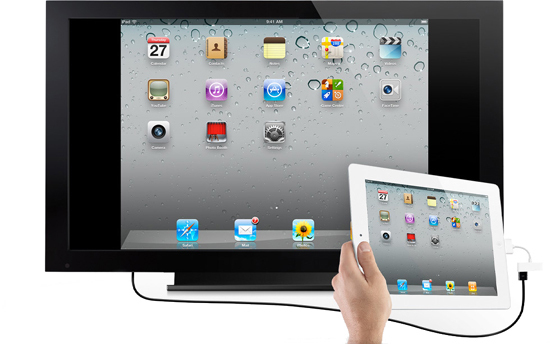 I will check if we can find any other simple ways by which you can connect your iPad to TV. If you are aware of any new methods, please share with us.